What does it mean to be a member of the working class in the twenty first century? I posed this question to my students earlier this year when I taught a class in oral history methods for the Institute for Research on Labor and Employment at UCLA. I focused the course on the study and collection of working class stories as a way to uplift voices not often heard in an academic setting and to develop an archive of interviews that broadens our understanding of the working class as a diverse and multifaceted cross-section of our society. 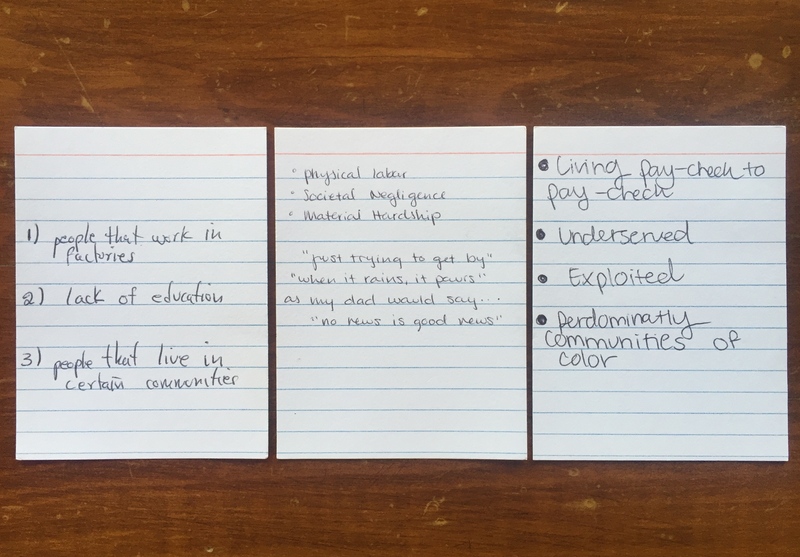 On the first day of class I handed out index cards to each student and asked them to define working class in three words or statements. How we define terms such as “working class,” “middle class” and “upper class” exposes our belief system as well as how successful the media has been in constructing meanings for us. In order to teach working class history, I wanted to understand what the term meant to modern college students in one of the most ethnically and economically diverse cities in the country. Photo courtesy of Virginia Espino. How is class structured in the United States? What are the intersections between class and ethnic identity, and do these intersections influence narrators’ lived experiences? What are the opportunities for, and barriers to, upward mobility? What role does unionism and labor organizing take among UC janitors? 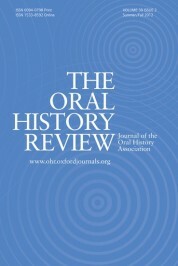 Each student was required to interview the same person twice in order to gain an authentic experience of the work oral historians do when approaching the life history. Returning to an interviewee for follow-up questions is the crux of a quality interview and often leads to a deeper dig into meaning and personal agency. And for the student interviewers, it proved essential in providing them with ample time to develop trust as well as time to step back from the process for self-reflection and self-critique. The students identified as members of the working class, but soon realized they were bringing their own biases to the interview process – specifically, the assumptions they had about the people who maintain the infrastructure of UC campuses. As stated in their project evaluation, they began their project with the belief that “janitors are poor and their job has low value…” They ended their project with a new awareness that janitors take pride in their work and want to be seen and appreciated by the students, faculty and staff who work alongside them. As a class we learned the varied meanings of working class through the projects students executed. In a surprising revelation, the students learned that one of the janitors they interviewed held a college degree: Unable to find a job in her field she was forced to take a position cleaning the UCLA campus to support her young family. Over the course of the quarter we were introduced to an Asian American student struggling to balance work and school. Her narrative forced us to reject the “model minority” stereotype that presumes Asian Americans float easily through school; her identification with the working class stemmed from her need to support herself through school, while many of her classmates receive unlimited parental support. And through an interview with a white male, we learned that the absence of jobs in the humanities has forced white college educated men to seek jobs in restaurants and department stores while struggling to maintain the lifestyle they desire. Taken together, these important narratives help us complicate what it means to be working class in the twenty first century. Featured image: UCLA’s Inverted Fountain by Andrew “FastLizard4” Adam. CC BY-SA 2.0 via Flickr. Virginia Espino is a historian turned filmmaker who currently teaches oral history, Chicanx history, and Labor history at UCLA. She is a co-producer of the film No Más Bebés that examines the history of forced sterilizations at a large public hospital. Her current project is an investigation into the foster care system through the voices of those who encounter it on a daily basis.